This prequel to The Maze Runner series tells the story of Mark and his friend Trina, who both survived the sun flares by meeting up with Alec, a military type, and Lana, a nurse. They have set up a small community, where they are managing to survive with some others. Then, giant Bergs descend with soldiers shooting darts at people, who are then infected by a virus that drives them insane and then kills them. Several of the group die, but Alec, Trina, Mark and Lana set off away from the town, where they happen upon a little girl, Deedee. Deedee has been shot by the arrows but is not ill, a fact which makes her group, headed by the zealous Jed, believe that she is sent by the demons who are causing all the trouble. Mark and Alec get separated from the girls when they try to escape Jed, and stumble upon a Berg landing site, where they find out that the Post-Flare Coalition in Alaska has sent the virus to kill the population, but the virus is mutating. They also find out that the girls are back in the hands of Jed's group, so they take off in a Berg to try to find them. Things go from bad to worse, and even when they find the girls, keeping everyone safe is impossible. The best they can do is to get Deedee to the government facility in Asheville so that she can be studied for a possible cure for the Flare virus. There are frequent flashbacks to thirteen years previous, when Trina and Mark survived the flares and met up with the others. This was an action-packed, nail-biting novel of suspense that will appeal to fans of violent, dystopic novels. I never knew who would die next, and around every corner there lurked some danger or other. Fans of the series will not be disappointed. I was really looking forward to this prequel to the Maze Runner trilogy because I thoroughly enjoyed those books. (Team Minho FTW) However, this wasn't what I was expecting. There's a prologue and epilogue that focus on the characters of the Glade but other than that, this is a completely different story with new characters. It's still interesting and action packed with characters as intense as the ones we've come to know but for fans looking for more information on Thomas, Teresa, or Brenda, they might be disappointed. I was hoping for more background on the Gladers themselves. For those readers who are just beginning the series, I would say to this is a good place to start. The Kill Order takes place thirteen years prior to the initial time setting of The Maze Runner. This is before Thomas and the Glades, even before WICKED was created. This is the story of Mark and Alec and their group of survivors after the Sun Flares. For readers looking to read more on Thomas, this might be an initial disappointment. But that shouldn't stop fans of the Maze Runner Series from skipping this prequel. The story line is excellent. Although not what I expected, I enjoyed learning about the years that brought the world from what we know today to the world of the Glads. It puts a whole new perspective on the world Thomas and the Glades lived in. I came to understand the world they grew up in and what helped create their characters. Mark and Alec are realistic and likable characters, it took me awhile to tear away my bias as I read. ( I have to admit I really wanted to know more about the Gladers!) But once I got past it- the characters of The Kill Order are strong and resilient. This is a must read for any Maze Runner Fan! The Kill Order by James Dasher is the prequel to his New York Times bestselling series The Maze Runner. It tackles the origin of the sun flares and the deadly mutating virus that can turn anyone into a certified Crank. However, despite Dashner's clever idea to publish a prequel that'll provide a deeper insight to the aforementioned worldwide crisis that literally wiped out more than half of the planet's population, I honestly did not see the point of this book. After reading The Maze Runner series over a year ago, it's an understatement to say that I completely and totally understand The Kill Order. Truthfully, I didn't understand many parts until a dim light bulb goes on in my head. 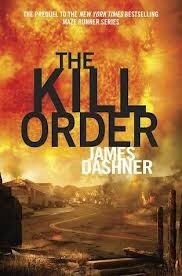 The Kill Order was much more interesting than The Maze Runner. It was not as good however. The reason I like The Kill Order is because we finally find out what was truly behind the Flare. The background book. The prequel. It has the same amount of pages as The Maze Runner, The Scorch Trials, and The Death Cure. The main plot was told from Mark's POV. It tells of a story of a young boy forced to undergo a journey full of unknown. (Not as unknown as Thomas's journey in the Scorch Trials or The Death Cure). He finds courage and truth as the plot unfolds. He fights for his life and other lives. He believes full heartedly in the cure that will be found. He seeks the cure and then realized the truth behind the Flare and the Cranks. He finds the hidden. The epilogue was amazing. We get to see Thomas's removal from his mother. We see how his name was created. We see the beginning of Thomas's journey. This is why this book is only the prequel. Teresa... Only in the beginning. I really like her. I felt she was like Talia al Ghul. Except the part that Ra's al Ghul is WICKED. Mark... He's desperate for survival. He fell hard when he found out he had the Flare. He loves Trina and for most of the book, he searches for traces of her. He wants to find the cure. (Duh.) Mark was a sweet boy in the beginning. As the events unfold, we see Mark become more and more Cranky. (Ha ha). In the end, we see a huge character change. He becomes a cold killer and a good murderer. He's an expert at survival in the end. Trina... She doesn't do really much in The Kill Order. It's evident that Mark loves Trina. Trina loves Mark as revealed in the flashbacks. She's more of an object the main character wants or is more of the goal the main character needs to pass. Alec... An ex-soldier. He's intelligent. Smart (I know I'm repeating this stuff). Wise. A sage. Athletic. And gun smart. He is like a mentor to Mark. Obviously, he dies in the end. He had the Flare like Mark and Trina, unfortunately. Deedee... A minor character who affects the path of the main character. She's around five years old. That's all I am going to say about Deedee. 1) Everybody dies except for Thomas and Deedee. Again, assuming Deedee didn't die. 2) Most of the characters have the Flare. Rating of The Kill Order: Three out of Five. The Kill Order, the prequel to one of the best series out there. I was kinda disappointed with this book, it just wasn't as good as the original series. I liked the idea and all, with the origin of the Flare, I thought it was brilliant and horrible. I thought it was sad for those leaders to think the solution is to destruct, really sad. What I didn't really like about this book is how Mark didn't think twice about killing, and ran off with Alec when he could be protecting his friends, his actions had no real reason. I really liked the plot, and how it explained a few details that linked with the Maze Runner (Crankheads, the origin of the disease, and immunes). Although it had parts with Thomas and Teresa in the prologue and the epilogue, it didn't really connect deeply, which is both good (freedom to write) and bad (Thomas is awesome!). I thought that the ending was kinda sad, how everyone just died. The whole journey for Mark and Alec to the base was really worth nothing at all, as they did not pass the information on to anyone, so it just died with them. They could of spent the time they wasted doing better things, like stopping Bruce and helping Deedee and Lana. I also felt like Mark and Trina should of spent more together, as in the blurb, the book hinted it was about them, not Mark and Alec, who were never to far apart. -Its pretty cool and sad to find out that the Flare was created by humans to murder half the population because of resources.